Since I began this focus to find 60 new experiences for my 60th year on earth, I seem to be more tuned into life. It truly is an adventure when you live each day looking for something exciting to happen. I'm not really good at it yet, but I figure if I keep at it, it will become natural to me and can only add more enthusiasm for beginning each day. With rheumatoid arthritis, the beginning of days is a bit tedious, so any "distraction" from the physical realm is a good one. This has been a good one and I intend to make this an annual tradition. You can read about my journey from the beginning of the adventure. #31 of 60 - Our sweet and wonderful neighbors, Ken and Yvonne Bushell, have moved to Knoxville to be with their son and grandchildren. Before leaving they asked if we wanted a Christmas Cactus. I'm not much on houseplants. I guess it's because we do so much gardening outside and on the deck. 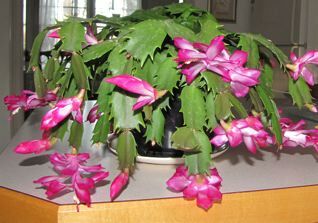 However, I used to plant-sit for a friend of mine who had a gorgeous Christmas Cactus when they still had their winter home in Florida. I've missed getting to see the plant for quite a few years now, so I couldn't resist, especially after Ken told me it had been in the garage and should've been dead but instead it was beginning to bloom. It was me or the trash .... so we have a beautiful addition to the family and a plant that I've never owned. We have named her Christy. Ken was my wildlife buddy three doors over on the cul-de-sac and always prodded me on to learn more and more about my camera, since I don't have a natural affinity to technical gadgets. They enjoyed watching the wildlife as much as we do and Ken took incredible photos of the birds that visited their yard and deck. He had a lot of woodpeckers since he refused to cut down dead trees. Instead, he had them topped off at about 18-20 feet so the woodpeckers could nest in them and all birds could still find bugs to eat. Dead trees are called snags. Over 500 species of birds, 300 species of mammals, and 400 species of amphibians and reptiles benefit from snags for food, nesting, or shelter. See some of Ken's photos. #32 of 60 - Since we weren't going to be with family for Thanksgiving, we planned a trip to the city of Charlotte, NC, with several new experiences on the agenda. Although I'd driven through the city many times on various trips and even lived in the nearby town of Gastonia for a few months when I was single, I had never taken an exit in the city. Our first stop was to visit the McGill Rose Garden, but being Thanksgiving Day it was closed. We walked around the exterior getting some photos through the bars on the fence and enjoyed many flowers that were spilling over to the outside. We then visited an area called Historic Fourth Ward, where there were 100-plus-year-old Victorian homes that had been restored. The striking contrast of these homes with the backdrop of skyscrapers at the end of the block was quite odd. It was like somebody dropped in a stage set behind the homes. Our other downtown Charlotte visit was to Freedom Park. Interestingly, downtown Charlotte is actually called Uptown Charlotte. Freedom Park was next to The Nature Museum which wasn't open at the time. It was well used by dog walkers, joggers and leisurely walkers, which included us that morning. 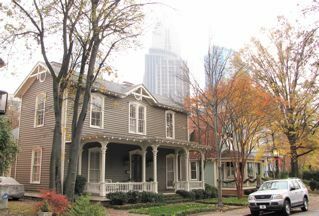 View Uptown Charlotte Photo Album. #33 of 60 - The most inspiring place we visited in Charlotte was the Billy Graham Library. It's an "ongoing Crusade." 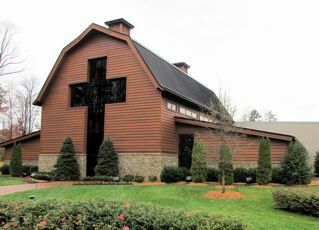 Until the vision for the Billy Graham Library was explained with those words, Billy Graham was against the idea of a library bearing his name, so adamant was he against anything that would detract from the message he has preached for more than 60 years - a message that points to Christ alone as the way to God and away from any human strategy or effort to gain salvation. Reminiscent of Billy Graham’s upbringing on a dairy farm on the outskirts of Charlotte, the Library building is styled after a dairy barn. Billy Graham’s childhood home, built in 1927 on their dairy farm about 3 miles away from the Library has been moved and beautifully restored. It's filled with family photos and personal items of the Graham family. The tour begins and ends with multimedia presentations. The first one lays a foundation for what guests encounter in the exhibits and, at the end, another to consider the same call Billy Graham has extended to millions of others in 185 countries. The Library is not a memorial, nor is it a museum. It's a ministry, prayerfully planned with the intention of communicating the unchanging, life-giving message of Jesus Christ to hundreds of thousands of visitors each year who may never attend a Crusade. View Billy Graham Library Photo Album. #34 of 60 - McDowell Nature Center and Preserve. The preserve encompasses 1108 acres of forested, rolling terrain along the banks of Lake Wylie. 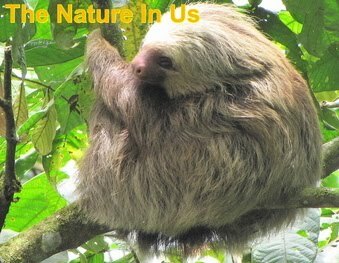 Over 90% of the nature preserve has been left undeveloped and offers terrific wildlife viewing and hiking opportunities. 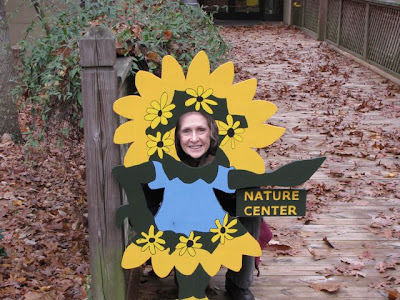 The nature center served as a gateway and housed exhibits with a variety of informative displays on the preserve's natural communities and wildlife. It had a gift shop with some unique items and great prices. We purchased a few things for our sponsored Compassion International children, such as postcards and temporary tatoos of butterflies (girls) and frogs (boys). There are nearly seven (7) miles of trails giving a wide range of diversity to explore while enjoying scenic views of the lake, forest or streams. We chose the Cove Trail which was a .8 mile moderate hike along the shoreline of Lake Wylie, hoping to see some shorebirds in this deep cove. The brochure promised ducks, muskrats and mink and a beautiful Fall display of color in the maples that were very prevalent along the trail. View McDowell Nature Preserve Photo Album. 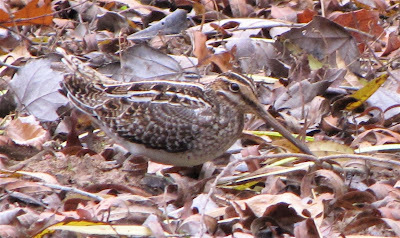 #35 of 60 - As we approached the Lake Wylie cove at the McDowell Nature Preserve, something flew out of the water's edge onto a drier area, but only Randal's sharp eyes could detect where the Wilson's Snipe was since it was so well camouflaged. I kept trying to find it with my camera zoomed in, but it was motionless for the many minutes we kept searching the distance across the cove for it. Finally Randal took the camera and got the first shot to prove there was something there. I figured it flew away while our eyes diverted for a few moments. There was not a twitch of movement, but then while we were looking, a bird flew into the other side of a tree nearby it and Randal thought it was a hawk, so the bird on the ground had more reason to remain motionless to blend in with the leaves. After seeing the photo we both knew we'd never seen this bird before. That beak was so very long and the coloring was so beautiful. Since I didn't have my field guides I had to post the photo on a bird forum to find out what it was. The extremely long bill is used to probe in the mud for small invertebrates and is actually flexible. The tips can be opened and closed with no movement at the base of the bill. Sensory pits at the tip of the bill allow the snipe to feel its prey in the mud. An unusual thing about the Wilson's Snipe is the clutch size is almost always four (4) eggs. The male takes the first two chicks that hatch and leaves the nest with them never to return. The female cares for the other two and apparently has no further contact with the male. View McDowell Nature Preserve Photo Album.